Assault rifles are known as the Jack-of-all-trades as far as rifles are concerned. So why would you want to own something that is very specialized like the 50 Beowulf cartridge? Because specialization is possible if you know in advance what your environment and circumstances look like. For instance, people will look back with alarm on historical photographs of World War II commandos carrying submachineguns as their primary weapon. With a maximum range of 200 meters, what would these commandos have done if their enemy showed up with full-size rifles and machineguns? The answer to this question is: “The commandos knew that they would have the initiative since they were attacking and had the element of surprise.” So the enemy would not be likely to detect them until the commandos were very close to them. There is also a very good chance that the commandos were aware of the surrounding terrain and the known enemy positions around their objective … they would not have been carrying submachineguns if they knew that the terrain afforded the enemy a chance to engage them protractedly with rifle fire. Can you say this with the same confidence about your situation? If you live in a heavily built-up area, it is likely that you will not have to take 300 meter shots. If you live in a wide-open area, the calculus will be slightly different. Yes, you can be attacked at extended ranges … but do your lifestyle choices indicate that this kind of pre-meditated attack is likely to take place? Very few reported cases exist of ‘sniper’ like shootings at long range … it is much more likely that an opponent(S) will attempt to surprise you at locations where you must slow down, stop or assign your attention to another task. Places like a gate where you must get out of your vehicle and manually unlock the gate or perhaps the moment that you are getting out of your car to walk into your house. In this situation, a firearm that is tailored for close-quarters shooting is a definite advantage. Such is the case of the 50 Beowulf—it is a very effective close-range option for your AR-15, with a maximum kinetic energy at the muzzle of 3000 ft-lbf. This effectively converts your 5.56mm AR-15 to a very hot 308 Winchester. What is different is that the bullets for the 50 Beowulf lack the aerodynamic efficiency of the 308 Winchester and will drop like a rock much past 50 yards. Recoil is another issue. They say that the direction of a fight is often determined by who lands the first accurate shot. With disciplines such as boxing, the first boxer to land the first solid punch statistically wins more often than they lose. Shooting firearms under stress follows similar logic—if you start your shot string with accurate firing techniques, you will likely end the string with accurate firing techniques and your average accuracy will be better. What I like about the 50 Beowulf is that it will allow what should be a ‘knockout shot’ if you shoot it accurately at close range. Since a 30-round M16 magazine will hold (10) 50 Beowulf cartridges, it would behoove you to shoot the cartridge as accurately as possible. The recoil and muzzle flip slows your recovery time—the first time that I shot this cartridge was the Speer 325gr Gold Dot from the bench. When I pulled the trigger, the last image that I recall was the bottom of the front sight tower. The next thing I remember is that my ears were ringing (indoor range, wearing ear protection.) It is a mighty cartridge but if you are willing to put in the time and practice to get good with the gun, you won't be sorry. Heavy projectiles with a low length-to-diameter ratio are generally adept at penetrating barrier materials because they don’t tumble inside of the material. You increase the penetration ability of a bullet by reducing the bullet diameter. 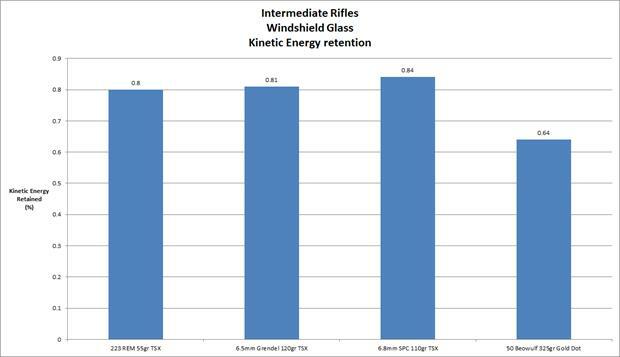 This is unfortunate because, for the same bullet weight, reducing the bullet diameter will increase the length-to-diameter ratio which will then increase the likelihood of the bullet to tumble. You can decrease the weight and the diameter to reduce the likelihood of tumbling inside of the material. 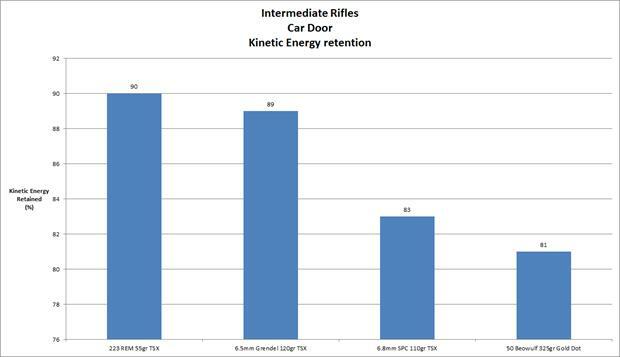 But then the bullet weight is low and this will reduce the momentum available to keep the bullet velocity up. 50 Beowulf projectiles do feature a low length-to-weight ratio and high mass. What it lacks is high velocity and the larger diameter bullet hurts it in terms of barrier penetration capability. This cartridge should be very similar to a shotgun slug in terms of limited barrier penetration. Despite the cartridges overwhelming physical appearance, please do not confuse it as being especially useful for hardened target defeat applications without the use of specialized armor-piercing ammunition. My choice for self-defense and medium game hunting would be a 325gr JHP pushed to 2000 ft/sec. This will be more than enough gun for shots within 200 yards. FBI Standard test fixture simulating a target using the thinnest part of a car door for cover. Simulating a shot into an attackers chest then through an interior wall and into a gelatin block on the other side. FBI Standard test simulating a shot through a car windshield.